Enjoy a one-hour hot air balloon flight as the sun sets over the Sonoran Desert in North Phoenix, Arizona. You'll experience breathtaking 360-degree views of the famous Sonoran Desert landscape throughout your flight. Upon landing, you will be have a celebratory toast, post flight fare prepared specially by locally renowned Wildflower Bread Company, and receive a commemorative certificate of your flight. Upon meeting at the check-in office, your pilots and crew will transport you to the launch site location, where you will have the option to become hands on and help the crew, or take in the view as the gentle giant comes to life. Before loading into the basket, the pilot will conduct a safety briefing, so make sure to listen carefully! Then you are up, up and away into the beautiful Arizona sky. 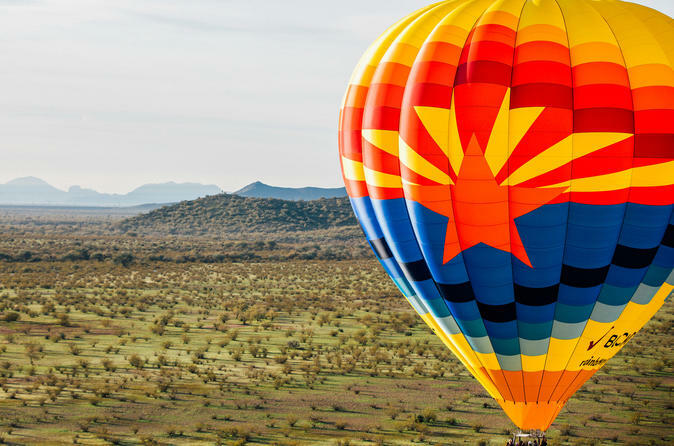 During your hour-long flight over the famous Sonoran Desert, you will have a 360-degree view no matter where you stand in the basket. The pilot will be your tour guide in the sky, explaining what you are looking at, how far you are going and how high you are ascending. Upon landing, you will be greeted with a celebratory toast (a tradition dating back to the 1800's), post flight food catered for you by locally renowned Wildflower Bread Company, and each passenger will receive a commemorative flight certificate. Once the balloon is packed up and all passengers are ready to go, the pilot and crew will bring you back to the check-in point where you can purchase souvenirs to commemorate your aeronautical adventure. A great experience to check off your Bucket List!